When Southwest Airlines (SWA) began operations in 1971, it had three airplanes and a route structure that included just three cities in Texas. It was not much more than an idea that Herb Kelleher drew up on a cocktail napkin at the Saint Anthony Hotel in San Antonio, Texas. Today, Southwest is an international carrier with 700 airplanes approaching $20 billion in annual revenues and topping $1 billion in net income. From the beginning, the company built its competitive advantage around a simple, efficient operating model and a culture unique to air travel. The most astonishing factoid about Southwest is that it has not had a single layoff in its 44 years—a stunning accomplishment in an industry that leads the economy in bankruptcies, re-organizations, mergers and companies that have disappeared. Think Eastern and Pan Am. It’s not rocket science. Storytelling is part of the culture that binds people to a purpose. A Dayton, Ohio customer agent offered to take a customer’s pet hamster to the agent’s home for a month while the customer visited a sick mother in another city. A five-year-old boy waving enthusiastically at an SWA plane taxiing along a tarmac got a thrill when the pilot opened his window and waved back. The boy’s mother captured the incident on camera and sent it to the company in appreciation. Dining in a Dallas restaurant one evening, Gary Kelly and his wife were astonished when a waiter came to their table to say that two SWA pilots also at the restaurant had recognized the couple and anonymously paid their bill. They also sent a note of appreciation—written on a cocktail napkin a lá Herb Kelleher. Any company can create a competitive advantage from its culture by instilling processes designed to keep it going. At Chief Executive’s CEO Talent Summit in Dallas, J.P. Donlon spoke with Gary Kelly to learn how SWA does it. 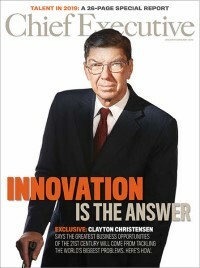 J.P. Donlon is Editor Emeritus of Chief Executive magazine.